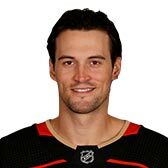 John Gibson is 6' 3 and weighs 210 pounds. He is currently 25.8 years old. Might return to the lineup on Friday of this week.